One thing that we have struggled to get our heads around since moving to the UK is how far in advance it is necessary to lock in long weekend activities (actually, all activities for that matter). Back in New Zealand, we never had to think about what we would be doing over long weekends as it would involve either visiting family and friends or going to stay at the beach house (none of which involved any foreplanning or organising). This year we missed the boat on every public holiday. Bad planning aside, we still wanted to get out of the country for Easter as this year it fell on Alex’s birthday. The least extortionate trip we could find was a bus ride to Cardiff (note for this occasion, we are considering we live in England, therefore, were travelling out of the country). After a hideously early start and a 3 hour bus ride, we arrived in the gloriously sunny capital of Wales. Having suffered through a British winter, we had never truly appreciated the joy feeling the warmth of the sun on your face could bring until now. We were all smiles. 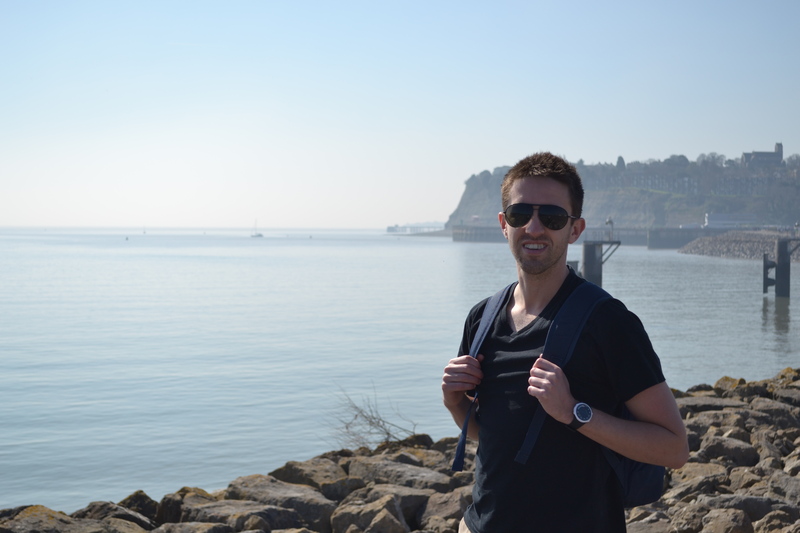 Cardiff is a beautiful city set alongside an enclosed harbour, with a modern town centre surrounding a centuries old castle and had a very different feeling to London. The whole town was full of cute families out for a Sunday excursion, enjoying the sunshine. We spent the morning exploring the city, then heading down to the waterfront to check out the harbour and to smell the ocean air (something that we complain about being deprived of in London). Later in the afternoon, we were back in the city centre, sitting at a restaurant outdoors, enjoying a Rose with the last of the sunshine when there was a noticeable shift in the type of people surrounding us. Gone were the strollers, children and parents, and out came the fake tan, sky high heels, big hair and sequins. Let me just reiterate, this was 3.30 in the afternoon. We started to feel a tad out of place in our jeans and t-shirt combo. As the afternoon rolled on, the scene became more fascinating, so decided to stay put and people-watch and got over feeling wildly underdressed. One of the funnier things we saw was a heavily sterioided, orange and tribal tattooed guy in a t shirt about four sizes too small, whipping out a (small) wad of cash and counting it a few times before paying for his round of drinks (which were not beer but all pink cocktails for him and his bunch of very similar looking mates). We left the silliness for a more civilised dinner to celebrate Alex’s birthday. After dinner, we ventured back into town and came across a scene that trumps the clubbing scene in Hamilton in every way – every second person was stumbling rather that walking, and the ones not stumbling were already on the ground, the majority of what people was saying was incomprehensible (not sure whether this was because they were speaking Welsh or speaking drunk), the lines for the ‘clubs’ were huge and full of people trying very hard to pretend that they are sober so they get let in. If anyone has seen the programme The Valleys, this is not a collection of the most extreme examples of the youth of Wales, it is a fairly accurate representation. We were so entertained by the goings on that we did multiple laps around the clubbing block to have a few giggles. 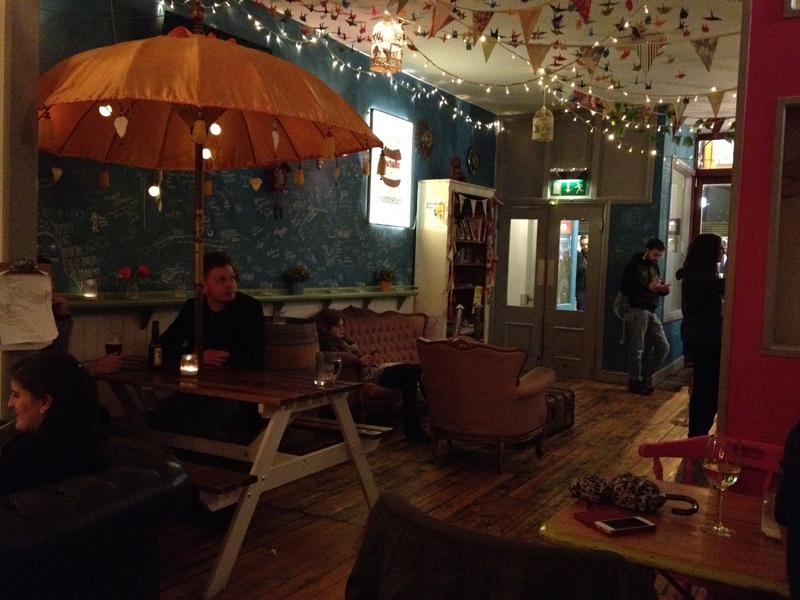 For the evening, we found the most chilled out, relaxed, normal bar we could – a bar at the bottom of a hostel (!!) where everyone was just acting like normal human beings. The next day brought even more sunshine, so, intent on soaking up as much of the Vitamin D while we could, we went in search of a sunny spot for breakfast. After breakfast at a delightful location overlooking the harbour, we went on the seawall walk along with the rest of the inhabitants of Cardiff. On the way we noted that the Dr Who experience was in a prime location by the water, then continued on past. It was so nice to be by the ocean once again. The harbour in Cardiff is like none we had seen before. 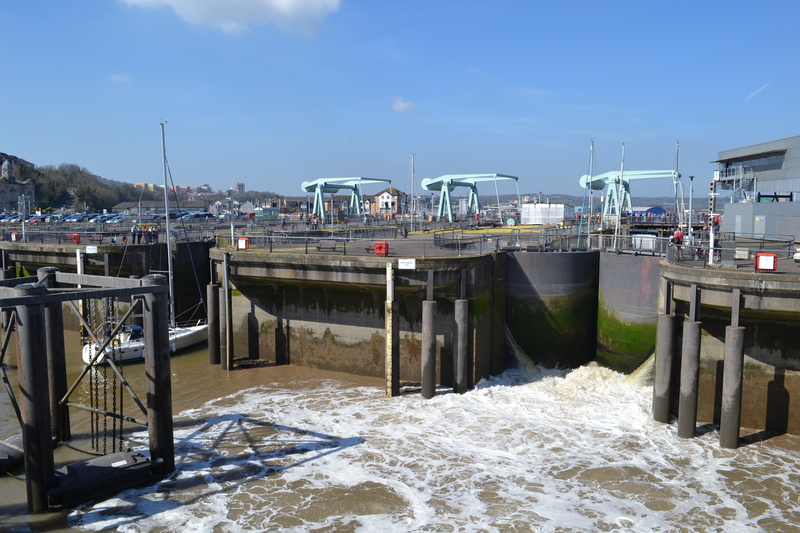 The entrance to the harbour was completely blocked off with a lock system to get in and out. We had never seen a lock of this size before so watched a fair few boats go through before moving on. We decided to catch the water taxi back to Cardiff as we were in need of some lunch. The one that picked us up was not as good as the taxi we saw sailing around earlier which had Captain Jack on the stern and the Pirates of the Caribbean theme music blasting. After a nice lunch in the sun, we both realised we were feeling quite hot so headed back to the hotel. On the walk back, it became quickly evident that we were not just feeling hot, but also turning pink and had developed some sunburn. Having not seen the sun for so many months, we were unprepared for needing to sunblock while outside (although luckily my face was fine as my moisturiser and foundation both have SPF). This made for an uneventful afternoon, hiding from the sun and feeling a little guilty for our irresponsibleness. 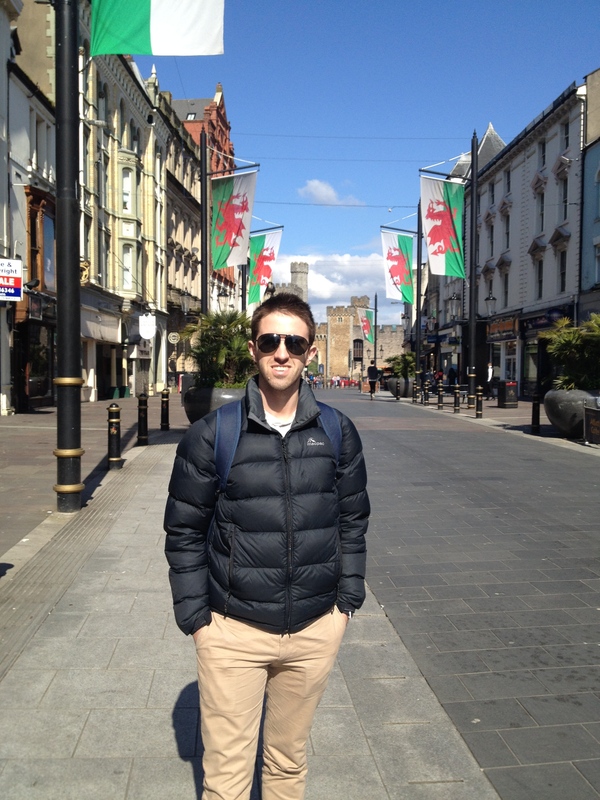 Upon our return to London, we both had many questions as to the location of our Easter break holiday, assuming we had been sunning off the coast of Spain, and were met with a lot of laughter once we had to disclose the source of our sunburn was in fact Wales.